More than just scissors, our Amplify® Shears are premium shears designed for cutting extra-thick materials. They sense blade separation and force the blades back together to cut cleanly through heavy materials. Choose Amplify® Mixed Media Shears for cutting thick craft and tough mixed media materials like corkboard, thick cardstock, magnet and much more. 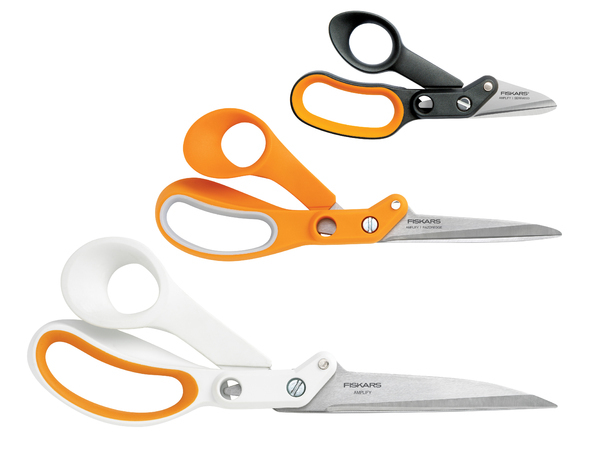 For clean, crisp cuts through thick fabrics like leather, upholstery, vinyl and multiple layers, choose Amplify® Shears enhanced with premium-grade, stainless-steel RazorEdge™ blades honed to an ultra-sharp edge. All styles are available in three sizes for cutting in tight spaces, all-purpose cutting and large-scale projects requiring long, clean cuts. All include a sheath to protect the blades and a lifetime warranty.